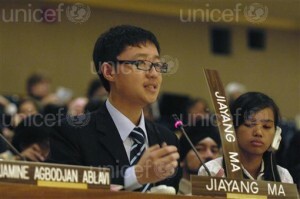 Participation in decision-making is one of the key priority areas of the United Nations agenda on youth. One form of youth participation at the United Nations is through the inclusion of youth delegates in a country’s official delegation to the United Nations General Assembly and various functional Commissions of the Economic and Social Council. The youth delegate programme is coordinated by the UN Programme on Youth at the global level, but it is the responsibility of the Member States to establish a youth delegate programme at the national level, and to decide who will represent the young people of their country. The roles of a youth representative varies from country to country, but normally includes providing input to their delegation on issues related to youth and participate in their delegation’s general work through attending meetings and informal negotiations. The Third Committee is the arm of the General Assembly that deliberates on Social, Cultural and Humanitarian Issues. Matters that pertain specifically to youth currently fall under the agenda item called “Social development, including questions relating to the world social situation and to youth, ageing, persons with disabilities and the family”. Generally, this agenda item is considered in the Third Committee of the General Assembly during the month of October; however, this is subject to change based on the annual programmes of work adopted by Member States. The agenda of the General Assembly, including that of its Third Committee, is usually available in late summer at the web site of the General Assembly. A youth resolution is traditionally adopted every two years. Typically the youth delegates that have been selected for the General Assembly also participate in the Commission for Social Development, since the work of the two bodies is closely linked. The agenda of the Commission for Social Development is available. The Commission on Sustainable Development (CSD) is responsible for reviewing progress in the implementation of Agenda 21 and the Rio Declaration on the Environment and Development, as well as providing policy guidance to follow up on the Johannesburg Plan of Implementation (JPOI) at the local, national, regional and international level. The CSD meets annually in New York during the month of May for two weeks, and is open to both governmental and non-governmental actors. Young people can participate either by being a member of their country’s official delegation, or by representing an NGO through the major group for Children and Youth. Participating NGOs must be in consultative status with the Economic and Social Council (ECOSOC), including those accredited on the CSD Roster. In this section you will find detailed descriptions of the youth delegate programme of some Member States. Each Member State determines the selection process and the role the youth delegate should have at the intergovernmental meetings of the United Nations. This handbook is produced by the World Federation of United Nations Associations. The handbook is not produced by the UN system, and can assist you in developing a proposal and budget for a national Youth Delegate Programme, as well as taking you step-by-step through creating your own campaign for such a Programme. 1. Contributions from youth delegates and NGOs.